Social Media has revolutionized the way marketers think about mediated communication. It is a term used to describe programs and devices that allow users to interact with each other, create and share information about themselves, brands, and other mutual interests in online communities. It is an indispensable tool for any business today. More and more business today are using Social media tools as the preferred communication method of choice. Why, because it is a free form of communication, it is easily accessible and it is immediate. And lately we are seeing social media used in some of the most innovative, creative ways, which I am sure we will see a lot more of in the future. Mars, the leading Food, Petcare and Chocolate company, is one of those that came up with an innovative, creative way of using social media to attract new graduate talent. 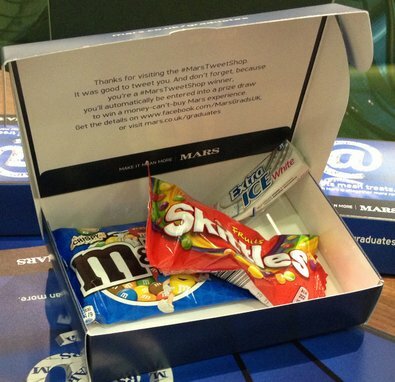 The Mars ‘Tweet Shop’ visited nine universities across the UK in February to encourage students to swap Tweets for Mars treats and information on its graduate recruitment program. Rather than vending on money, the Tweet Shop operates on Tweets. While standing infront of the on-campus machines, students following @marsgradsuk simply send their Tweet to @marsgradsuk with the hashtag #marstweetshop. 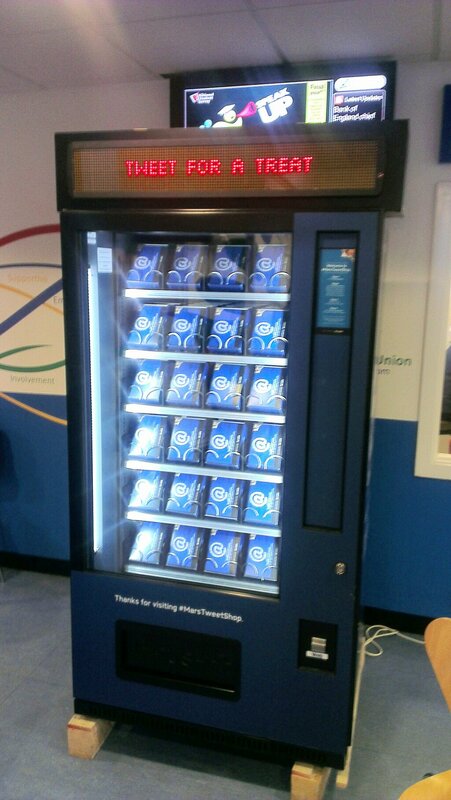 The vending machine panel then displays a unique code which when entered releases a Mars product and information on the company’s graduate scheme. It’s luck of the draw whether the Tweet Shop dispenses a Mars bar, a Dolmio Express! Pasta Sauce, a Pedigree pouch or Wrigley’s gum, but all products will include information on Mars’ Graduate scheme and how to apply for a role. The @marsgradsuk Twitter feed was also active throughout the time, providing students with information on the graduate scheme across the business and retweeting the best student tweets. The Mars Graduate program runs annually and attracts some of the best graduates from across the country. Graduates at Mars have the opportunity to work across the different arms of the business and in different programs which are designed to teach the necessary skills required for the trade. Mars runs graduate programs across six different areas of business including: Management Development, European Finance, Commercial, Engineering, R&D and Sales. Mars has taken social media and recruitment to a whole knew level. This innovative, interactive campaign was very successful and the start to what we will see in the future. This entry was posted in Student Work and tagged Mars, Marstweetshop, social media. Bookmark the permalink. This is a really cool idea! I wish we had this at the UofO! I would tweet all day for free candy! I wonder what other companies would do the same type of campaign? I could see Gum companies doing it to give people a chance to tweet for a free piece of gum or pack? Who knows. It would be cool if they had it for coffee.